Mumbai: The giant cranes that once worked long into the Mumbai night are still, the roar of concrete mixers has dulled, and hundreds of migrant workers have gone home. A slowing economy, high interest rates, tighter credit and a falling stock market have left developers in India’s financial hub scrambling for cash and delaying or cancelling ambitious commercial and residential projects. 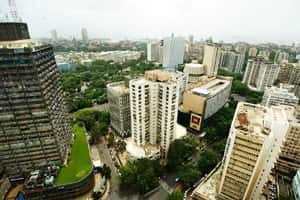 The Mumbai skyline has been transformed in recent years as developers rushed to build gleaming office blocks, swanky apartment towers and sprawling malls. Land prices quadrupled in some areas in the last three years, and commercial and residential spaces in Mumbai come under the world’s most expensive. Land and property prices could fall by 15-50%, with some distress sales expected in the months ahead, analysts say, with a sustained slump having a serious impact on the already stretched infrastructure of the city and the country. With half of India’s wealth tied to property, according to CLSA estimates, the potential impact on banks and the economy is big. Economic growth of about 9% a year in the last three years had boosted demand for hotels, offices, homes and malls, as well as roads, ports and airports. After India eased rules on inward investment in the construction industry in 2005, foreign investors including Citigroup Inc. and JPMorgan Chase and Co. pledged some $20 billion (Rs1 trillion) for the property market, and developers were also buoyed by easy credit available. Now, much of that foreign money may not arrive, while banks are averse to real estate lending because risks are perceived to be higher, ratings agency Icra Ltd said. Private equity firms and global banks, which had hankered for slices of big realty projects, have turned off the tap, while banks are subjecting home loan applicants to greater scrutiny and demanding bigger margin requirements, scaring off buyers. Enquiries for office space have slowed all year, and rentals even in such prime locations as Nariman Point in south Mumbai have fallen by 10-15%, CB Richard Ellis estimates. In the central business district of Worli and Parel, where glass-and-chrome office towers have replaced derelict textile mills, rentals have fallen and will soften further as large banks and software services firms put the brakes on expansion plans. “Consumers are postponing decisions to rent and buy, while there are delays in project execution on account of shortages in manpower and working capital funds," said Icra, which recently downgraded several real estate firms. Shares of the country’s four largest real estate firms DLF Ltd, Unitech Ltd, Housing Development and Infrastructure Ltd, and Indiabulls Real Estate Ltd are down by more than 75% so far this year. Desperate developers are offering broker commissions for the first time, negotiating on quoted rentals, and even throwing in freebies such as furniture, home appliances, jewellery and cars. “It is the home segment of more than Rs100 million, where demand is very weak because it is linked to big bonuses and stock market returns, which have taken a hit," said Abhishek Lodha, a director at developer Lodha Group. Only in the segment of less than Rs1 crore is there still buyer interest, he said, while the segment of Rs1-10 crore has been hit by tighter credit. The tough environment has deterred Prashant Shetty, a finance professional, who abandoned his search for a two-bedroom apartment in suburban Mumbai a few months back. ?“Prices haven’t bottomed out yet. I’m willing to wait." The Reserve Bank of India this month announced a slew of measures to ease the pain, allowing housing finance firms to raise funds through short-term overseas borrowings and lowering the risk weight for banks’ exposure to commercial real estate. Still, there is a higher risk of debt refinancing and debt and interest defaults, Citigroup Global Markets said in a report. Developers will change strategies, focusing on mid-income housing, for instance, and on execution and completion of existing projects rather than buying speculatively. But Shetty, whose lease runs out in January, is unconvinced. “I am renewing my lease on my apartment," he said. “That’s what makes the most sense for me now."